Beverly Hills is bordered on the north by Bel-Air and the Santa Monica Mountains, on the east by West Hollywood, the Carthay Neighborhood of Los Angeles, the Fairfax District and on the south by the Beverlywood. Beverly Hills contains some of the largest homes in Los Angeles County and in the nation. With a median home price of over $2 million the homes range from extravagant and luxurious in size, to the more elegant and modern homes, and then to the many small duplex rental units and detached homes with less than 2,000 sq ft.
Gaspar de Portolà’s land expedition arrived in the area on August 3, 1769. The group consisted of Portolà (the first governor of the province of California), some Franciscan priests and a cavalcade of leather-jacket soldiers and horses. On September 27, 1821, New Spain became Mexico and the province of California quietly changed flags. That same decade, retired Spanish soldier Vicente Ferrer Valdez and his wife, Maria Rita Villa de Valdez, (settled on the 4,500 acres) Rancho Rodeo de las Aguas. Rita did not care for the name, however, and chose to call it San Antonio. The Valdez adobe home was built near what is the present day intersection of Sunset Boulevard and Alpine Drive. Valdez died in 1828, leaving Rita and eleven children. California was ceded by Mexico to the United States in 1848 with the Treaty of Guadalupe Hidalgo, marking the end of the Mexican-American War. It was admitted as a U.S. state on September 9, 1850. In 1852 Maria Rita Valdez De Villa asked to purchase a league of land for $4,000. She called the land Rancho Rodeo de las Aguas. It was later purchased by Major Henry Hancock (of Hancock Park fame), a New Hampshire attorney. He had come to the state during the 1849 gold rush. He used the land as a farm until 1868 when Dr. Edward Preuss, a native of Louisville, Kentucky, bought the land. A brief oil boom raised interest in the area in 1865 when the Pioneer Oil Company bought the rights to drill wells. 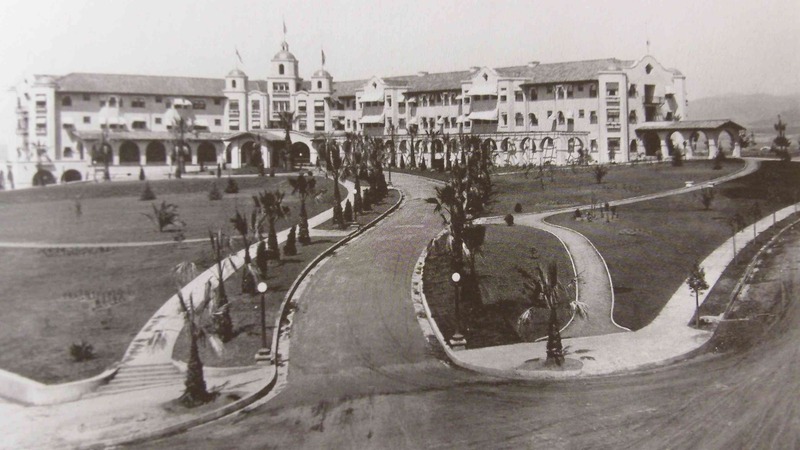 In September, 1911, work began on the Beverly Hills Hotel. The Los Angeles Times would call it a “monster hostelry” since it cost $300,000. In 1919, Douglas Fairbanks and Mary Pickford bought land on Summit Drive and built Pickfair. 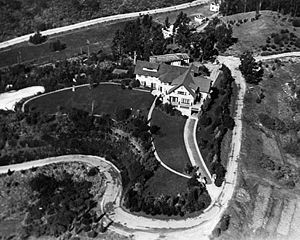 In 1921, they announced that they would build the home which they had been “dreaming” about in Beverly Hills. 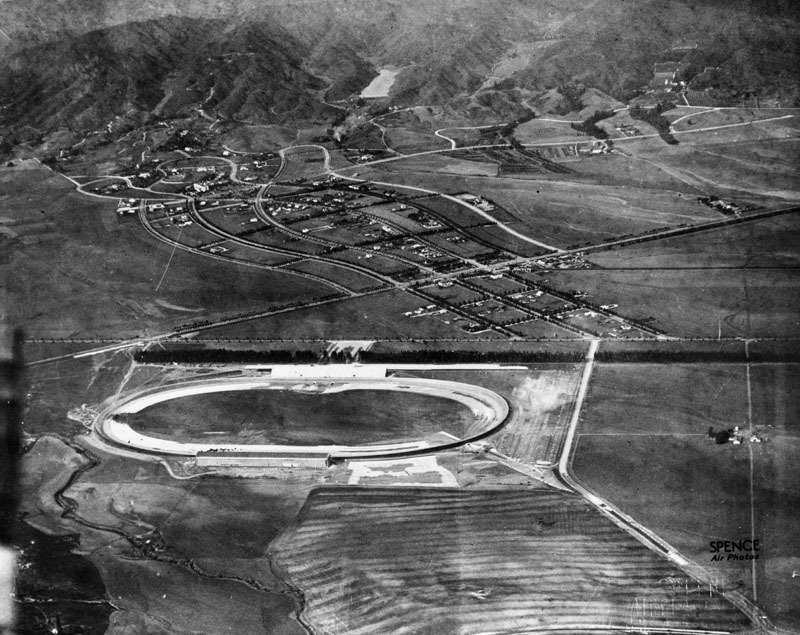 In early 1920, the Beverly Hills Speedway, a 1.25 miles wood oval track with turns banked 35 degrees was opened. Joe Boyer ran his race car 110 miles per hour during the exhibition run. The speedway was closed in 1924 and the site was later subdivided for housing and businesses. The movie colony was well entrenched by 1928 when Harold Lloyd (‘Greenacres’), John Barrymore, Robert Montgomery and Miriam Hopkins built residences there. The population in 1920 was 674; in 1924, it was 5,000; by 1930, it was 17,429. In 1923, annexation to the city of Los Angeles was proposed, but faced opposition. Residents Mary Pickford, Will Rogers and others mobilized local voters against the plan. Those for annexation argued that Los Angeles would provide an adequate supply of better quality water for growth. Workers left bottles of sulfur-smelling water on the doorsteps of every home in Beverly Hills with a label that read: “Warning. Drink sparingly of this water as it has laxative qualities.” Despite the campaign tactics, annexation was defeated 507 to 337. The following year, the city voted $400,000 in bonds to purchase the water system from the Beverly Hills Utilities Company and drill additional wells. This fight for an independent city was arguably the first union of show business and politics in the United States. When Will Rogers became involved in the local city government the community received international advertising. In 1925, Rogers was given the title “Honorary Mayor of Beverly Hills,” becoming the first and (to date) only person so honored as such. The same year, the citizens of the city voted a $100,000 bond issue to purchase with Los Angeles, Santa Monica and Venice 385 acres for the building of UCLA. There were 96 miles of paved streets in the city limits by 1927. In 1928, the Beverly-Wilshire Hotel on Wilshire Boulevard between El Camino and Rodeo Drives, part of the old Beverly Hills Speedway, was completed. That same year, Greystone Mansion was completed by Edward L. Doheny, Jr., the only son and heir of wealthy oil man Edward L. Doheny. And in 1930, horses were banned in the City of Beverly Hills. In the early 1930s, Santa Monica Park was renamed Beverly Gardens and was extended to span the entire two mile length of Santa Monica Boulevard through the city. At its Santa Monica and Wilshire corner, the Electric Fountain, a constant symphony of form and color at night, was installed, with a small sculpture at the top of a Tongva kneeling in prayer, homage to the heritage of Beverly Hills as a wellspring of fertility and abundance. In April 1931 the new Italian Renaissance style City Hall was opened. By 1933, the effects of the Depression were being felt in Beverly Hills. The city and school board cut salaries to save funds. In February, some 161 parcels of land were advertised for sale for delinquent lighting assessments. The Chamber of Commerce established an employment bureau and the mayor requested a branch welfare office from the County of Los Angeles. By 1937, the city had weathered the storm of the Depression and was riding the crest of a wave of retail sales that reached more than $20,000,000 and bank deposits topped the $25,000,000 figure. Property values of that year showed a 30% increase over the previous year. By the 1950s, small vacant lots remained and developers cropped whole mountains to ease the housing shortage. The stables and trails of the unusually large Doheny family estate, Greystone Mansion was bought by Paul Trousdale. The Trousdale Estates area was eventually annexed and an expensive housing development began to take shape in the hills above the city. Beverly Hills marketed itself as one of the most glamorous places in the world to shop. The Golden Triangle, with Rodeo Drive at its center, was marketed as the apex of chic shopping and fashion. Via Rodeo was completed in 1990. The Spanish cobblestone street leads to 2 Rodeo Drive, a “mini-mall” with upscale shops and restaurants. In 1992, the Beverly Hills Civic Center was opened. Designed by architect Charles Moore, it links the new public library, fire and police departments with the historic City Hall. Rodeo Drive, Beverly and Canon Drives all recently underwent construction to widen the sidewalks and beautify the streets. New construction has also just been completed that added more parking for visitors to the famed shopping area. Beverly Hills is nearly entirely surrounded by the city of Los Angeles, sharing only a portion of its eastern border, primarily along Doheny Drive, with West Hollywood. The precise limits of Beverly Hills are complex, and therefore hard to describe; however, the city limits can be roughly described as the area surrounded by the Los Angeles Country Club and Century Park Drive to the Southwest, Whitworth Drive to the South, variously Doheny Drive/Robertson Blvd/San Vicente Blvd to the East, and the Hollywood Hills West to the North. Major east-west thoroughfares in Beverly Hills include Wilshire Boulevard, Santa Monica Boulevard, and Sunset Boulevard. Shopping is prevalent along Beverly Drive and the world-famous Rodeo Drive. Coldwater Canyon Drive is the main road out of Beverly Hills to the north into the San Fernando Valley. Beverly Drive and Roberston Blvd exit to the south into the city of Los Angeles. In spite of the city’s name, most residents live in the “Flats” of Beverly Hills, a relatively flat area of land that includes all of Beverly Hills south of Sunset Blvd. The homes in the hills north of Sunset Boulevard have a much higher value than average homes in the rest of Beverly Hills, and the most expensive homes in Beverly Hills are all in the hills. Santa Monica Boulevard divides the “flats” into two areas, locally known as “North or South of the tracks,” referring to the train tracks that were once used by the old Pacific Electric streetcar line that traversed Beverly Hills along Santa Monica Blvd. Homes south of Wilshire have more urban square and rectangular lots, generally smaller than those to the north. There are also more apartment buildings south of Wilshire Blvd than anywhere else in Beverly Hills, and the average home value south of Wilshire is the lowest in Beverly Hills. Nearly all businesses and government offices in Beverly Hills are located south of Santa Monica Boulevard, two notable exceptions being the Beverly Hills Hotel and the Beverly Hilton Hotel. Just outside the city limits to the west lies the Los Angeles Country Club. Other locations commonly associated with Beverly Hills include the Cedars-Sinai Medical Center and the Beverly Center, just outside city limits to the east.